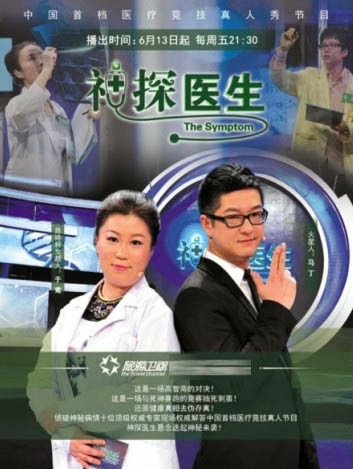 China's new reality TV show is "Miracle Detective Doctor"
Launching this weekend, China's latest reality TV show "Miracle Detective Doctor" has the lofty aim of entertaining and educating the masses in medical matters and also easing the ongoing crisis in violent disputes between patients and medical staff. Starting on prime time tonight (13 June) on the Travel Satellite channel, the show (also translatable as 'Super Sleuth Doctor') will feature two teams of three medical students who will compete to find the correct diagnosis in a series of simulated medical cases. The teams of would-be doctors will go through three rounds of 'work up'. The first will be video clips that give background of the fictional illness. The second round will feature simulated patients who can be questioned by the contestants about their condition. In the third round the medics are given a fictional 'health budget' gold coin that they can choose to spend on various tests and investigations such as x-rays or pathology tests. If that sounds a bit dull, director Tang Li says the show will be livened up with appearances by 'poison tongue' reality TV show hosts such as Ma Ding He and also the beautiful female celeb star of medical dramas, Yu Ying Dan. The show has also modelled it's look on Korean TV medical dramas, and the contestants will be given makeovers to look like the popular Korean soap opera stars. However, the director says the show will not just be celebrity fluff. In China's current climate of frequent medical disputes, he says the 'medical tournament' will help improve relations between medical staff and the public. He says there is a lack of communication and trust between medical staff and the public that is a major cause of disputes, and the show aims to build up mutual understanding. He says the reality TV show will highlight the difficulties of deciding on diagnosis and treatment from a doctor's point of view and show the public that it is a difficult process. It will also educate the public about expensive scans and tests, showing that they are not routinely needed to diagnose illness, and that doctors usually rely more on a detailed history. Tang Li says the "Super Sleuth Doctor' will also feature top medical experts who will give their advice and pronounce their opinion. The cases are based on real life, and the pursuit of the correct diagnosis will be full of suspense, as the consequences of a wrong decision will be spelled out by the experts, he says. The show will also be like real life hospital in that the doctors will have to make their diagnosis under time pressure, and the effects of their decisions on the lives of the patients and their families can be very moving, the director says.